A first result from the Wytham scans - a single relatively small sycamore tree, around 20 m high with a dbh of 32 cm. 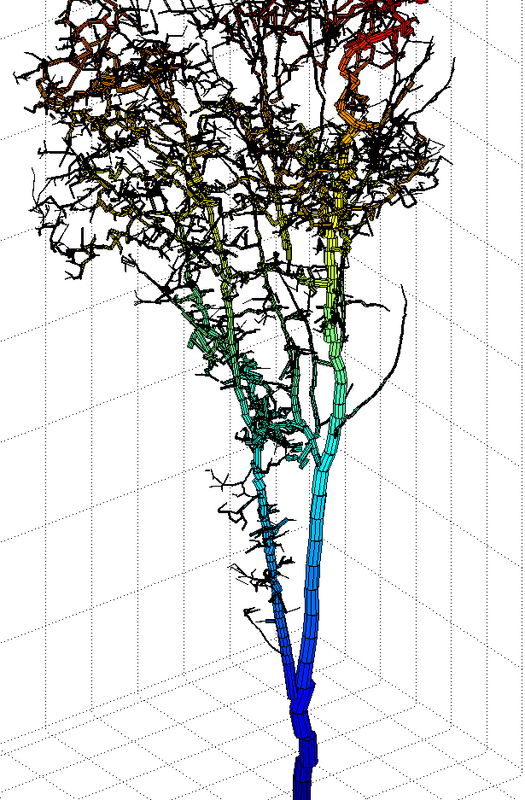 The lefthand image shows the point cloud recorded by the TLS, coloured by height (blue to red). The righthand image shows the reconstructed cylinder model, same colour scheme. The reconstruction does a very good job of picking out the main trunk and 1st and 2nd order branching. Less well on the upper parts as usual. This is exacerbated by being only scanned from 5 locations here. As we expand through the plot we will collect more information at the upper part of the trees, and then redo the reconstruction to compare with these results. May the sun always shine. A new opportunity to work at a piece of old English woodland came up earlier this year - Wytham Woods. This is a lovely 400 ha area of semi-natural, old woodland, just outside Oxford in the quintessentially English countryside, within sight of the banks of the Thames. The woods were bequeathed to Oxford University in 1942 and are now home to a range of scientific research activities into the fauna and flora. We are working with Prof. Yadvinder Malhi and his team at Wytham, to scan the established forest plots and estimate above ground biomass, as well as measure the structure of the trees. This is part of our ongoing work using laser scanning to characterise forest state. A really interesting thing about the work at Wytham is that Yadvinder has established plots which he is using to replicate the work he does in the tropics through the Global Ecosystems Monitoring (GEM) network, characterising the tree and plot traits (plant biochemistry) and function via ecophysiology measurements including C fluxes, soil and water properties. The TLS instrument in leafy Wytham, on a calm midsummer's day. Only the mosquitoes for company. 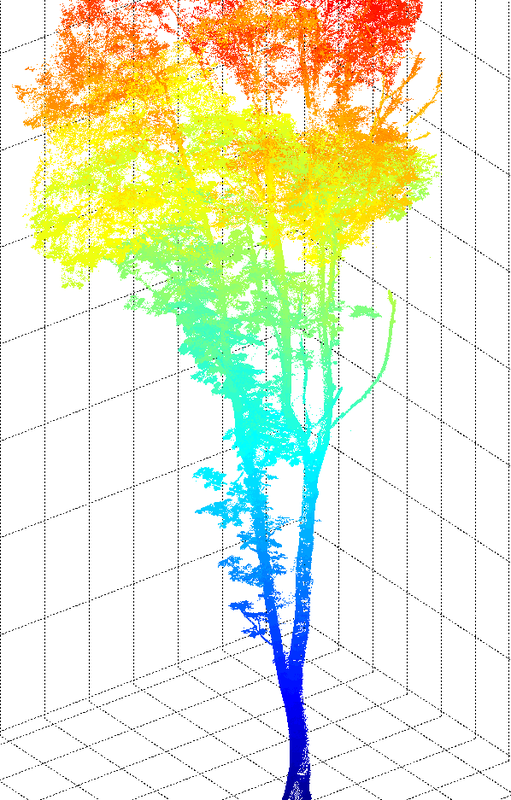 We aim to scan a section of Wytham within the SIGEO 18 ha plot, and characterise all the trees in 3D. We have scanned one part of this so far, and aim to return over the coming months to do leaf on, leaf off, and then repeat over the next few years. Another interesting aspect of the infrastructure at the Wytham plot is there is a tall canopy walkway. We are thinking about how we can scan from there to to really capture in fine detail the upper part of the canopy, which we do less well from the ground. Walkway infrastructure at Wytham Woods. From the top looking down, with John Armston (U Queensland/Queensland Govt) looking up through the oak, ash and sycamore canopy. Wytham will also form part of a separate EU-funded project, working with the National Physical Laboratory (NPL), which will deliver tools for doing calibration and validation of satellite-derived estimates of leaf area index (LAI) and fAPAR, which characterise the amount of leaf area, and the canopy absorbed radiation respectively. These key canopy properties are needed for understanding and modelling forest state and function, are widely-used but actually very difficult to measure in practice. As a result, validating (testing the quality of) satellite-derived estimates is also very hard, as we don't know the real values at anything other than very small scales (few m). One way to address this is to build very detailed models of the landscape, and then simulate what satellites and ground-based observers would see, where we know the LAI and fAPAR in advance. This is what we are aiming to do at Wytham, using the laser scanner to build 3D models of a section of the woodland, that we can use as a surrogate, model testbed for testing and validating new satellite measurements of LAI and fAPAR, among other things. Watching you watching me watching you. A crowd gathers to watch the scanner do its thing in Wytham. We've been gradually getting to grips with the Riegl VZ-400 and ironing out some of the quirks, while we go about scanning. We are very lucky to be able to work with colleagues at Forest Research, the research branch (ahem) of the UK Forestry Commission, based at Alice Holt on the border of Surrey and Hampshire. A longstanding collaboration with Dr. Eric Casella, who has mutual interests in TLS and 3D tree structure, has led to us being able to piggyback on his destructive harvest activities in the Alice Holt forest. We've also been working on this with Prof. Mark Danson, from Salford and his SALCA instrument, and in early July we all turned up at the forest to measure and harvest some trees. The experiments we've been doing are aimed at characterising the above-ground biomass (carbon) of trees using our laser instrument non-destructively and rapidly. This is important as we know forests sequester atmospheric CO2 as carbon in wood, but estimating this for larger areas is hard and uncertain, and relies on simple empirical models drawn from very small samples of trees. So we think we can measure all this pretty well with our laser scanner techniques - our results from Brisbane, Gabon and elsewhere have demonstrated this. But ironically, the best way to really convince people that it works is to cut down some trees and weigh and measure them in full detail. Which is a lot of work! Here we can see the moment one of the oaks was felled by the FR foresters. To do this for 3, moderately sized oak trees has taken (so far), I would estimate around 70 person days; it took 10 of us 3 full days just to strip and bag the leaves from the three felled trees. L to R: Dr. Rachel Gaulton (Univ. of Newcastle), Jingjing Yan, Meng Yu (both UCL MSc students), Lucy Walker (Univ. of Salford), Andy Burt (UCL), with the last leaf from the first, large tree. The second tree beckons enticingly from the tarp in the background. Having done all this we will know the dry mass (and density) of all the carbon in the wood of each tree and the total mass of all the leaves. For the woody carbon, we can then compare this with what we get using the laser scanner to (hopefully!) show that the scanner can be used to estimate it nearly as accurately, but faster, and without having to cut anything down. For the leaves, given that we know the area of a sample of leaves, we can calculate the specific leaf area, or SLA (the leaf mass per unit area). If we multiply the total leaf dry mass by 1/SLA we will know the total leaf area of each trees, as well as the amount of material in each layer. This is another extremely important property as the leaf area controls transpiration, CO2 exchange and perhaps most importantly, photosynthesis. The leaf area is therefore an important factor in the signal we can measure from remote sensing. 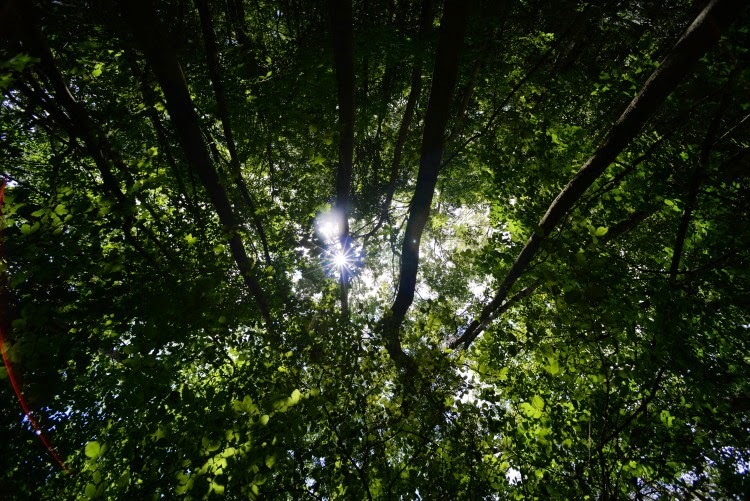 Our colleagues at Salford and Newcastle are using their SALCA instrument, which has two laser wavelengths, to help separate leaf and wood material from forest measurements. Our instrument is only single wavelength, and so can't do it this way, but we are trying to use other information, related to the laser waveform, return intensity and photographic RGB values, to try to do this. This movie shows a fly-through of the leaf-off scans from Alice Holt, done in early April. 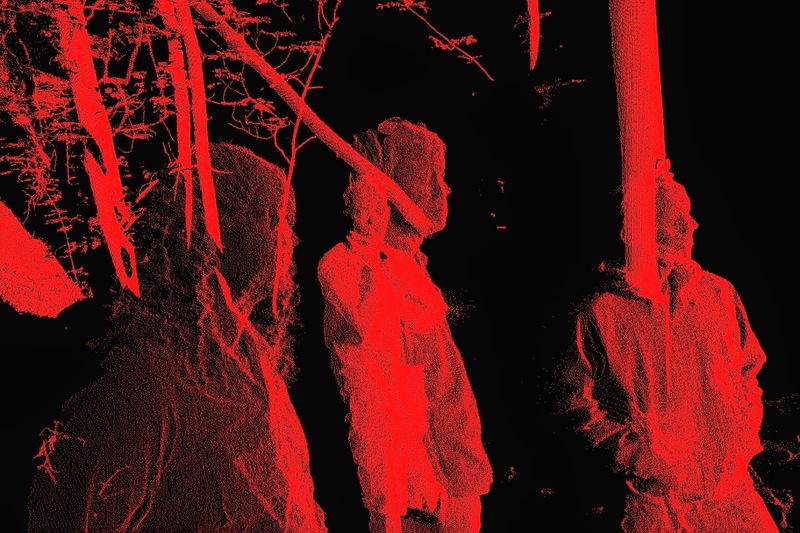 The point cloud is overlaid with the photographic RGB values. The white points are where the camera cannot see the point, due to occlusion (eg the upper side of leaves). So far, the results of all these measurements look very promising and many thanks to Eric in particular for organising the field campaign, and to all those who helped out.